Best Transmission Service in Michigan - 3 Convenient Locations! Determine what's wrong with your vehicle and solve the problem before it causes more serious issues by bringing your vehicle to American Transmissions. We offer computer diagnostic scans, maintenance, clutch replacement and repair services for automatic and manual transmissions. Contact us at one of our 3 convenient locations, to bring your vehicle in for a free inspection. 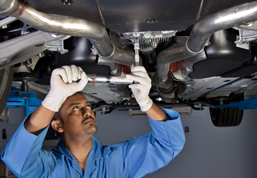 Our transmission repair shop services all makes and models of foreign and domestic cars, trucks, vans, SUVs, and RVs. We specialize in transmission work, but are also able to do light engine repair. In addition, transmission checks, electronic diagnostics, and road tests are all offered free of charge. At American Transmissions, we recommend servicing your transmission annually due to the extreme temperature and weather changes that occur in Michigan throughout the year. Our mechanics are always straight-forward with you and happy to explain all of your options should a problem arise. We offer a 12-month or 12,000-mile standard warranties for all of our work. Extended warranties may be available upon request. American Transmissions honors most used car warranties.